We sell plant material in a variety of forms depending on the species, time of year and ease of packaging. 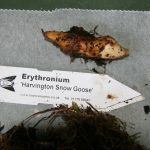 Erythronium bulbs are despatched when they are dormant in mid to late summer. They are easily damaged in transit or during planting if they are in full leaf. We sell them at the best time for you to plant them either in pots or directly in the garden. Roscoea and Trillium are sent to you bare-rooted when they are virtually dormant. Rhizomes and tubers are underground thickened stem for storing the plants energy. In the case of Roscoea which are in the ginger family of plants, they have a small rhizome with fleshy, thick, tuberous roots attached similar in appearance to dahlia tubers. We send both Roscoea and Trillium rhizomes to you with plenty of roots on at the right time to plant them directly into your garden or to pot them up. The roots are crucial to their successful establishment. Hellebore seeds must be sown as fresh as possible. We therefore send them to you soon after collection. Our Hellebore plugs are young vigorous seedling plants that are despatched to you just as their roots are ready to grow down into a bigger pot. They need potting up as soon as possible after you receive them. Plants grown in pots are ready for planting directly out into your garden. They can be planted out at almost any time of year as long as they are kept watered in the summer during establishment.